Read the story and look into the eyes of the sweet Zoe. Andrea was listed as the “pet of the week” at the shelter. When I was perusing the paper and saw her picture, I knew immediately she was no “Andria” she looked more like a “Zoe”. She looked like a boxer, with that really cute crinkle between her brows…and as the day went on, the pet of the week was already wrapping strings around my heart. By the end of the day…she was mine. She was in pitiful shape; underweight for her age, infested with parasites, and according to the staff of the shelter, someone had cut her tail off with scissors, and it was infected; but with patients, love and affection she healed. I thought I was rescuing a dog in need, little did I know she was rescuing me. I had been diagnosed with Fibromyalgia and Bipolar Disorder and my marriage was in the “We are trying to force our wills upon each other.” stage. Zoe came in and taught us unrequited love. We learned to talk in a softer voice, because yelling upset her, and because neither of us was willing to live without her…she taught us to live together as a family. When I was feeling sick or my medications weren’t working well, she was/is always there beside me. Zoe is 9 years old now, she’s as true and faithful as anyone could ask. 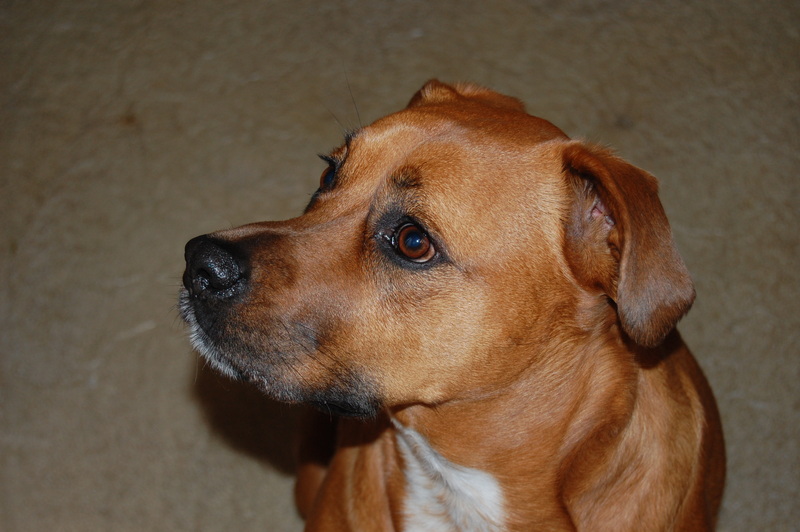 She doesn’t so much look like a boxer anymore more like a Staffordshire terrier/boxer mix. She’s opened a whole new world for me. She has been a marriage counselor, nurse, companion, and so much more. And, as in her names, she’s gone from A to Z and taken me on the most cherished journey of my life. I hope that she feels every day the love I have for her, it is unyielding. 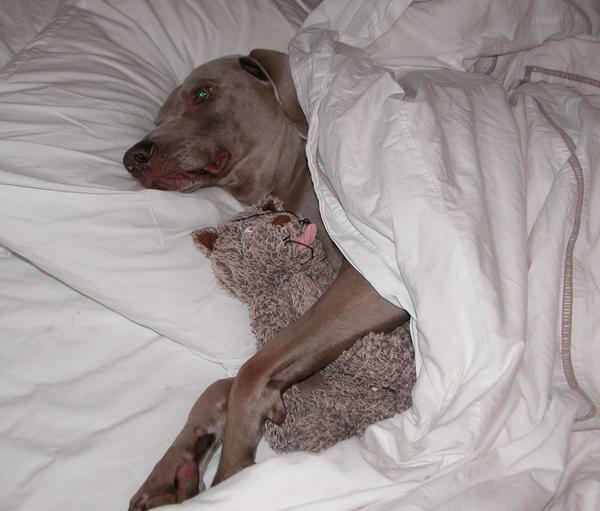 The lovely story of Baron, a Weimaraner, from Maggie Miller. You should know: I didn’t rescue Baron so much as he rescued me. I’d wanted a Weimaraner for years. Initially taken with their eerie beauty, my attraction developed into full-blown obsession. I read about the breed, talked with breeders, and consulted the national Weimaraner rescue organization. Over and over, I read and was told the same thing: the breed wasn’t a good match for me, a twenty-something apartment-dwelling corporate PR flack. They need lots of training, attention, exercise and space, I was told. They’re beautiful, but they’re not for you. While I accepted that acquiring a puppy from a breeder and trying to raise it on nights and weekends wasn’t any good for anyone – and that no responsible breeder would place a puppy with me – I was resolved to have a Weimaraner in my life somehow, some way. Enter Friends For Pets, the local Weimaraner rescue. They needed volunteers to handle dogs at weekend adoption showcases, and Big Sisters and Brothers to take dogs for occasional outings and weekends. Sold! When I began handling dogs at the adoption showcases, I didn’t know how to hold a leash properly, let alone manage big dogs that were bewildered and wounded by the circumstances that brought them to the rescue, and rowdy from being cooped up in kennels all week. But I quickly found my footing, and as my relationship with the dogs and the rescue grew, I was approved to be a Big Sister and take dogs home on weekends. Diane, Friends For Pets’ compassionate founder and director, has an innate skill for matching the dogs she rescues with volunteers, foster families and forever homes. 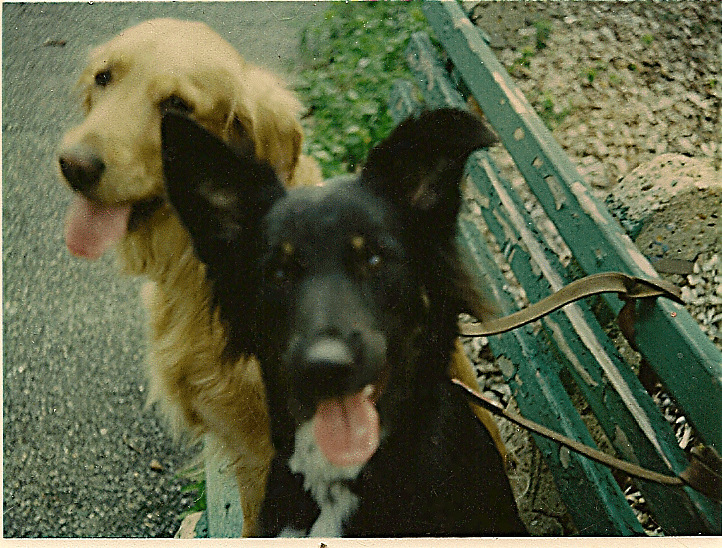 She knew I was licking wounds of my own – the recent death of my father and the slow, creaking end to a five-year relationship with my then boyfriend – and that the right dog could heal me as much as I could heal it. I was lonely and isolated. I’d moved to Los Angeles from San Francisco mostly for a job and partly to be with the one person I knew in all of Southern California: my soon to be ex-boyfriend. I lived in a tiny but cute apartment where my neighbors rarely made eye contact, let alone said hello. I drove an hour each way to and from a stressful corporate job where I was 15 to 20 years younger than my colleagues. Baron, an adult male Weimaraner of unknown age and little-known origin, was so depressed when he came to Friends For Pets, he was at risk of starving to death. He’d come to the rescue via a Riverside County animal shelter, where he’d been left in the middle of the night. At 90 pounds, Baron was passed over by families looking for younger, smaller dogs. On the day he was to be euthanized, a shelter worker alerted Diane, who drove out to Riverside and bought him out of the shelter. Back at Friends For Pets, bereft at the sudden and inexplicable loss of everything he had ever known, Baron curled up in the corner of his crate, cried incessantly, and refused to eat. I began picking up Baron from the Friends For Pets kennels after work on Fridays and returning him on Sunday evenings. In our 48 hours together, we’d lie on the floor and watch movies, snuggle in my bed, and walk around my neighborhood. He was terrified by the sounds of traffic, cars backfiring and the people coming and going in my apartment building. His paws, unaccustomed to walking on concrete sidewalks, would blister and bleed if we walked more than a few blocks. Weekend by weekend, Baron’s paws developed calluses, he regained a healthy appetite, and he became confident and interested in the world around him. And as he took up residence in my heart, Baron formed a supple callus where it had been broken. I became his person, and knew he couldn’t ever go back to the kennels. So he didn’t. It took six months, but I moved us to a little house with a fenced yard in a beach community where I made friends and talked to my neighbors and ran races. I got a job with less stress and more flexibility. And I let go of my dying relationship with the boyfriend. By then Baron had ceased to be afraid of most things, but he was still spooked by the sound of waves crashing at the beach. Determined that Baron should know the joy of running on sand and feeling the foam wash up between his paws, I took him to a cove in Malibu where dogs were allowed off leash. A long path led down to the beach, and I spent two days getting him down it, tugging at his collar, cooing reassurances, and coaxing him with treats when he cowered at a crashing wave. Finally, just before sunset on the second day, I got him onto the sand. I removed his leash and let go of his collar. He took off across the beach, bucking and kicking his back legs like a horse and running a series of goofy figure eights before flinging himself into the frothy water. I was awestruck at the sight of such pure and utter joy in an animal in which so much pain and fear had once lived. Baron and I played together well past dark, and I thought, this is what people mean when they talk about being made whole again. This is what it feels like to let go and just…be. Three and a half years later, I had to let go of Baron forever. Unbeknownst to anyone, he’d had a brain stem tumor. Extremely slow growing, the tumors are silent until they reach the size at which they press on the spinal cord and interrupt the flow of fluid. One morning Baron became disoriented and stumbled, and by the end of the day he was unable to eat, drink or walk. The next few days were a blur of hospital stays, neurological consults, an MRI and a spinal tap. The conclusion: the tumor was inoperable, and Baron had no chance of making a meaningful recovery. Moreover, he was in agony — hungry, scared, immobile. Hefty doses of steroids and painkillers bought us another 24 hours together, enough time to say goodbye and arrange for his usual vet, Dr. L, to come in on her day off to euthanize him. I brought him home from the hospital for one last night, where he slept with me in bed under the covers. On the way to the vet the next day we stopped at our favorite walking trail, where I helped Baron onto a sun speckled patch of flowers. We lay there for a good hour, him smiling ear to ear and me memorizing the image in my mind and the feeling in my heart. And then we went to see Dr. L, and I held Baron in my arms and buried my tear-streaked face in his soft fur and thanked him for rescuing me while Dr. L administered the drugs that allowed him to peacefully slip away. In the years since Baron’s passing, I’ve continued to foster and adopt Weimaraners, mostly the “senior” dogs who get left behind. Every time I walk them past the spot on the trail where I took Baron that last day, I call up the memory of him lying in the flowers with that goofy smile on his face, and I silently thank him for giving me this new life of mine. People often ask me how I can bear to foster and adopt older dogs, knowing I’ll have to say goodbye. My answer is always the same: what they add to my heart is far greater than what I leave with them when they go. I feel very lucky that Michelle shared this story with me. You probably have to be a dog person to understand how this could happen. One minute my husband and I were talking about getting a companion for Piglet, our five-year-old Golden Retriever, and the next we were in a shelter staring at the saddest little ball of pathos a cage has ever held. Her nose was running, her coat was filthy, and her eyes were wet, desperate and pleading. At the same time, her tail was thumping like a jackhammer. She was one sick puppy, but there was something indomitable about her. At times like this, rational people leave. We, however, formed an instant rescue committee. We paid our “donation” and took the little mess straight to Dr. K, the veterinarian who’d looked after my dogs since I was in high school. Dr. K listened to the puppy’s lungs for a moment, removed his stethoscope and said she had one of the worst cases of distemper he’d ever seen. He didn’t know if he could save her, but he could try. It was up to us. But the decision had already been made. That panicked look on her face, that thumping tail. The puppy had picked us. We were her Obi-Wan Kenobi, her only hope. We had to try. After almost a week with Dr. K she came home with piles of antibiotics. Several times a day we had to run the shower until the bathroom filled with steam and sit with her for ten or fifteen minutes while she wheezed. She was too sick to be vaccinated, so she had to stay indoors. The unintended consequence was, whenever we took Piglet for a walk, the puppy went into a frenzy. After a few days she started to whine and howl every time we left the house, with or without Piglet. She was so loud, the new neighbor across the hall reported us to the ASPCA for animal abuse. That’s when we figured out her name: Decibel, dB for short. As Decibel’s health improved, boredom turned her into a one-dog wrecking crew. In a single day she chewed almost completely through the legs of a table that had belonged to my grandmother. We bought a puppy gate, but she climbed over it. We bought a second gate and stacked them. Did I mention we have high ceilings? The next day I came home to find she had scaled the two gates and eaten the couch. It was an 82-inch, Tuxedo-style sofa with lots of pillows and cushions, and she had chewed through all of them. The living room was knee-deep in mounds of white pillow stuffing. It was a little like that Rolling Stones video for “It’s Only Rock ‘n’ Roll” where the boys are in sailor suits and at the end they’re nearly swallowed up by bubbles. Except it wasn’t bubbles, it was my couch. I bought a third gate. She climbed that, too, but she couldn’t get over it. It was too close to the top of the doorframe. When Decibel finally was healthy enough to go outside, no one would ever have guessed she’d been sick. She ran and jumped and caught balls in the air like an all-star outfielder. She was also my little early warning system. Every once in a while the hair on her neck and shoulders would stand straight up and she’d start to bark. Sure enough, I’d see some dodgy character. Unfortunately, Decibel was a disaster in the dog run. Her muttly mix was full of Border Collie and the herding force was strong. She chased the other dogs around in circles, barking and nipping at their heels until they cowered together in a corner. Gradually she grew up, calmed down, and became the dog that sits on your feet because sitting near your feet wouldn’t be close enough. The dog that looks guilty whether or not she did it. The dog that sidles up with a toy in her mouth and a look in her eyes that says “playtime” at 5 o’clock in the morning. The dog that makes you laugh really hard. Decibel was a great, crazy dog. And then she was nine. Piglet, now 14, was developing the kidney problems that tell you an old dog’s time is getting short. It was winter when we took her to Dr. K and finally let her go. When spring came and the ground thawed and filled the air with aromas that make a dog’s heart sing, Decibel seemed to smell Piglet everywhere. She ran through the park wagging her tail, sniffing the ground and searching expectantly for her lost friend. That summer, for the first time in her life, Decibel wasn’t interested in running. Her feet seemed a little swollen — not all the time, but sometimes. Her appetite wasn’t great either. Then, out of nowhere, she collapsed. We rushed her to the nearest emergency hospital, the Animal Medical Center. She spent two days there hooked to an IV while they tested her for everything from Lyme disease to exotic parasites. Every test was negative. Probably a virus, they thought. When she collapsed a few weeks later, we raced back. Another day on an IV, more tests, and still no diagnosis. In September she started to go downhill again, and I took her to Dr. K. By the time we got to his clinic on Long Island, he had already reviewed her test records and figured out what was wrong: Decibel had Lupus. Lupus? He said there was reason to be hopeful. Canine Lupus can often be managed with steroids. It would all depend on how far the disease had progressed. If this were a fairy tale we would all have lived happily ever after. But that’s not what happened. With daily doses of steroid pills, Decibel ran, jumped and bounced around like a puppy for 14 days. And then, on our morning walk, she collapsed. I carried her home and sat down on the floor. She lay across my lap struggling to breathe. I hugged her and told her it was okay to let go. The little puppy that could simply couldn’t anymore. Just like that, she died in my arms. Reading this, you might wonder if it was worth it. If all the worry and ruined furniture and veterinary bills were worth the nine short years we had with Decibel. The answer is yes. It was a bargain.